THE MNL BINONDO LAUNCH + WIPHEADS ANNIVERSARY PARTY! 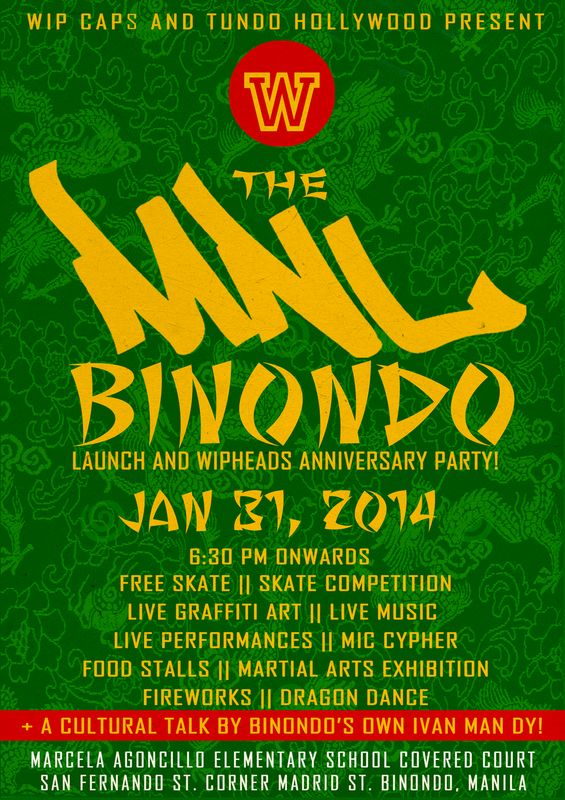 THE MNL ‘BINONDO’ LAUNCH + WIPHEADS ANNIVERSARY PARTY! HAPPENING ON CHINESE NEW YEAR! Come through and celebrate CNY with us on the 31st, 6:30PM onwards! Join us as we celebrate our first drop this year from our ongoing MNL District Series, this time, inspired by Binondo, famous for being our local Chinatown. We’ve got free skate, skate competitions, live graffiti art, music and performances plus some mic cypher action! We’ve also got food stalls, a martial arts exhibition–and to top it all off: fireworks, a dragon dance and a cultural talk by Binondo’s very own Ivan Man Dy, well known for his food tours around Binondo!